Here in the U.S, we don’t see or hear too much about hydrocarbon (HC) based refrigerant gasses. At least 19 states ban their use in vehicles outright and there are a variety of other federal and state regulations in effect as well. Every now and then some twit shows up on the Internet with the next big thing, but we never see him again telling how his compressor failed shortly thereafter because the oil became badly diluted. In other countries, the picture is vastly different. A variety of HCs may show up in mobile A/C systems and be perfectly legal. However, legal doesn’t mean safe. You may recall that the HC family includes such familiar names as butane and propane (plus many others), and these gasses are often used for heating and cooking. They’re used for those purposes because they combust easily and give off plenty of heat. Remember that combust easily part. 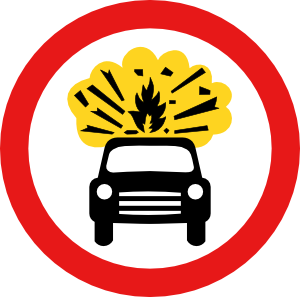 It’s that whole “risk of explosive gas inside the car” thing that rules them out as a refrigerant, and some countries are beginning to take action on a national basis. The government of Singapore recently announced that from April first of this year, the use of HC refrigerant in any motor vehicle will be prohibited. They further specify that the edict covers “all type of road transport such as motor cars, vans, lorries, buses and trains.” That’s “all” vehicles, not all new vehicles; some folks will have some changes to make regardless of the age of the vehicle. The hazard was recently pointed up by two unfortunate accidents in Australia. In both cases, tanks of flammable gas—not refrigerant in this case but possibly acetylene or propane—were stored in a vehicle at least overnight. When each operator returned to their vehicle, something they did caused a spark and the interior of the car exploded due to tank leakage. In both cases, the operators died. It is believed that whatever caused the spark was part of normal operation such as a door-lock solenoid moving or a light switch engaging. It’s not much of a stretch to extend that situation to a leaking hose or evaporator when HCs are in the air conditioning system. In Australia, the battle to eliminate HC refrigerants continues; the chemical’s use is illegal in some states and territories but not in others which makes for a confused and often scary repair market. Australia’s air conditioning trade group VASA is in the fight, and their CEO Ken Newton writes an informative and humorous column in ACTION magazine. Trying to eliminate HCs in mobile air conditioning is an ongoing battle worldwide and one worth watching. If you’re a service professional and not a MACS member yet, you should be, click here for more information. You can E-mail us at macsworldwide@macsw.org or visit http://bit.ly/cf7az8 to find a Mobile Air Conditioning Society member repair shop in your area. Visit http://bit.ly/9FxwTh to find out more about your car’s mobile A/C and engine cooling system. The 33rd annual Mobile Air Conditioning Society (MACS) Worldwide Training Conference and Trade Show, Be the Best of the Best will take place February 7-9, 2013 at the Caribe Royale, Orlando, FL. This entry was posted in Automotive, Automotive training, Mobile Air Conditioning, Uncategorized and tagged #air conditioning, #explosive gas, #HC, #hydrocarbon refrigerant, #MACS Member, #Macs worldwide, car, car care, car care news, car care news service, car maintenance, refrigerant. Bookmark the permalink. I very much doubt you will publish this, but here goes anyway…. Yet again MACS worldwide writes a commercially biased and error-prone article on hydrocarbon refrigerants. To imply that usage of HC in the USA is negligible is counter to published, peer-reviewed data and MACS Worldwide’s own sampling (refer to the 2004 article in the International Journal of Refrigeration by I Maclaine-Cross). MACS Worldwide sampling in 2002 (not long after the HC’s were made available in that market) already showed 2% market penetration – small but by no means negligible, and it has grown since then. It is also counter to the fact that in states where it is legal in the USA, HC refrigerant is stocked on retail shelves in big store names like WalMart and Canadian Tire. There are also three separate manufacturers of HC refrigerant supplying these stores in the USA (RedTek, EnviroSafe and Duracool). How could “negligible” usage sustain three independent suppliers for the last 15 years or more? Secondly, it is disingenuous to make reference to this-or-that jurisdiction that has banned hydrocarbons as some kind of justification for your argument, because those very jurisdictions were heavily lobbied by fluorinated gas manufacturers to put those laws in place for their own commercial reasons. The Singapore government decision was also strongly affected by the fact that they chose to rely heavily on advice from the fluorinated gas industry. To be fair, why don’t you also quote the case of the law in the state of NSW (Australia) banning hydrocarbons in motor vehicle AC systems (which, again, was pushed for by f-gas industry interests) that was REPEALED many years ago. Thirdly, why don’t you approach HC advocates for your information before publishing these kinds of opinion-pieces masquerading as facts? Instead you rely on “information” from Ken Newton and VASA. VASA is funded by the fluorinated gas industry so it is no surprise to hear them spouting their usual nonsense. It is a shame that you choose to repeat it without seeking comment from the other side. If you took a more balanced approach to your research, you would catch more of the errors I have pointed out to you. Finally, around 10% of all vehicles in Australia use hydrocarbon refrigerants. One supplier alone (HyChill) is responsible for supplying the equivalent of approximately 1 million vehicle charges into the Australian automotive market (see here: http://www.hydrocarbons21.com/content/articles/121920111201.php). Considering how large-scale usage is in Australia (let alone the USA and other countries) and recognising that there has not been even ONE cabin fire during normal road use, are you seriously suggesting that the world has just been ‘extremely lucky’ to avoid a cabin fire????? Anyone with the most basic understanding of statistics should surely recognise that it is basically impossible for there to be a serious risk of cabin fire when it is clear that millions of vehicles have employed hydrocarbons in their AC over the last 20 years without such cabin fires actually occuring. Finally, to imply that the recent trademans van explosions are even slightly likely to be the result of propane leaks is nonsense and reveals your lack of expertise on this subject. Propane lacks the combustion energy and flame speed to produce the kind of catastrophic damage that occurred in those cases (try it some time if you don’t believe me). It can only have been caused by acetylene or some similarly dangerous gas. To try and force a connection between these very sad incidents and the potential for ignition of approximately 250 gram of hydrocarbon refrigerant leaking from an AC system is just silly. I’m willing to hold a civil discussion in a public forum, including rebutting some of the apparently unsupportable points mentioned in your text. I didn’t bother to identify myself because I wasn’t even expecting you to publish my comment. But you did, so credit to you. My name is John W Clark and I am a Technical Advisor for HyChill Australia. Please suggest a place to publish an open, public interchange. If you would rather, I can suggest somewhere. I would, however, suggest that if you really want to start a civil discussion, beginning by characterising people who use hydrocarbons as “twits” does not reflect well your alleged intention to be civil. To begin, the "twit" remark was NOT targeted any reputable company, U.S or otherwise, that makes, tests, and certifies their product. The remark was aimed at our unique breed of home inventor who thinks that re-using a vat of some residential or commercial refrigerant in their car is a good idea just because they have it. Then they try to convince their friends via the Internet of the same idea without regard to any efficiency or effect. It may be a singularly American occurrence; perhaps there are no such idiots on your side. We have herds of them. Moving on, In your response you state "The Singapore government decision was also strongly affected by the fact that they chose to rely heavily on advice from the fluorinated gas industry. "To be fair, why don’t you also quote the case of the law in the state of NSW (Australia) banning hydrocarbons in motor vehicle AC systems (which, again, was pushed for by f-gas industry interests) that was REPEALED." Since you and your company (and others in the industry) obviously have a vested interest in any such discussion, we must assume that you as a group were also involved in lobbying the Singapore government. Why could you carry the day in NSW a few years ago but not in now Singapore? Are you serious about your suggestion to carry out the debate here, on a MACS Worldwide controlled website?? A website in which the publishing or redacting of content is at one party’s discretion clearly not a suitable forum for open and public discussion. Assuming you are quite intelligent, I must say I’m finding the list of reasons as to why you would think such a suggestion was appropriate to be rather short. I will happily debate the subject and respond to your original article and the new issues/questions you raise, but only on a forum where neither you (nor I) can alter or redact the content put forward. I’m starting to doubt that you’re serious about taking part in an open and public discussion. My first suggestion regarding one place we could conduct an open and public discussion is by utilising Google Docs. If you are not familiar with what Google Docs is then, well, just Google it – it’s like Microsoft Live, a web-based multi-user word processor. We could arrange for an independent third party not known to either of us – for example a Justice of the Peace or Notary Public to create a Google Doc(s) on our behalf and give us both read/write access and also make the document(s) publicly viewable on the web in perpetuity (so that neither of us can take the document offline). Google Docs retain a full record of all changes made (in like manner to Microsoft Word) and that history clearly shows who made what change and when. The discussion will take a good deal of time to cover all the topics. If necessary, my company is willing to pay for the Justice of the Peace/Notary Public to arbitrate on subjects that we are struggling to reach agreement on. That role would only need concern itself on ruling as to what statements are are deemed factual, rational or non-rational (i.e. opinion). Once that determination is made by the independent arbiter, the readers can make up their own minds as to which side of the argument holds more water. @John: “Are you serious about your suggestion to carry out the debate here, on a MACS Worldwide controlled website?? A website in which the publishing or redacting of content is at one party’s discretion clearly not a suitable forum for open and public discussion. Assuming you are quite intelligent, I must say I’m finding the list of reasons as to why you would think such a suggestion was appropriate to be rather short. There will be no change of venue. The original was posted here, your comment(s) were posted here and this remains a public forum open to all interested parties. Should you not have the spirit for a game on an “away” field, you may perhaps want to reconsider your heart for the play at all. The supposition of redaction or unfair alteration is unfounded and I challenge you to support the point to any degree. You may have met that elsewhere, but you will not see it here unless you step outside the usual lines of law, professional decency and common sense. Sorry for the delay, I have been otherwise occupied. Let’s assume I’m happy to take you at your word that you won’t redact, alter or anyway restrict access to the content of this post. On that assumption, there is still a serious problem of practicality: The WordPress commenting system is a really cumbersome medium for conducting a discussion on this subject. Our discussion is necessarily long and involved and therefore requires detailed explanations. This comment thread is already so large to the point where it is unwieldy. Anyone interested in this discussion trying to read and “get up to speed” on the discussion will rapidly get frustrated if we continue using this medium. I would expect that, if we are to cover all the issues that are likely to come up between us, this thread could conceivably grow beyond 10 times it’s current size. At that point not even I would be interested in trolling through it trying to find information. A newcomer to a thread that large almost certainly would give up before getting one tenth of the way in. My suggestion of using Google Docs was not just for the reason of independence and open, unredactable publication, it was also for the reason of practicality of better housing the discussion. So for the reason of practicality, can we please switch this discussion to Google Docs? If you’re not concerned about publication issues, then we can avoid having the third party create the document and either you or I can just create it. It will only take a matter of minutes to set up, then we will have a much more workable platform for continuing this discussion. Finally, as regards your repeated question about Singapore Govt decision vs WorkCover NSW, I can only give you a limited answer because I am not so familiar with the rules governing the construction and review of legislation in that country. What I can tell you is that in Australia almost all state legislatures have a mandatory “regulatory review” requirement on legislation. The required periodic “regulatory review” along with the harmonisation of certain state laws with federal laws led to the death of the restriction on use of hydrocarbons in motor vehicles in the state of NSW. In Australia “regulatory review” requires that skilled reviewers review previously enacted legislation in order to assess whether or not the matter the particular legislation intended to address is still relevant and justified. My understanding is that the regulatory review process identified that hydrocarbon refrigerants were being widely used in other states extensively and for many years and that there was no trend of incidents in those other states and therefore the justification for the particular restriction on HCs in MAC was invalid. In other words, the legislation was found to be based on mere opinion unsupported by facts. Yes, of course, we registered our objection (on numerous occasions) to the NSW government about that law while it was in place. If you want to call that lobbying, then so be it. For the record, the only organisation that is an advocate for HC’s (amongst other naturals) that sought out the Singapore government from my neck of the woods regarding this legislation was the Green Cooling Association. Any advice they would have given would have been quite general in nature as their (one and only) staff do not have detailed technical understanding on the subject. My company, HyChill certainly did not seek them out to “lobby” them or whatever you want to call it. Howver, they did indeed contact us for our point of view, and we gave it. (i) Has the Singapore government based it’s recent hydrocarbon bans on any evidence whatsoever of statistically significant trend of incidents (specifically, fires) resulting from the use of hydrocarbon refrigerants in accordance with HC manufacturer advice and basic common sense? If not, how would you go about characterising the Singapore government’s decision as being based on anything other than opinion? (ii) Is a refrigerant actually (in the real world, that is) unsuitable for application X because oligopolist competitor DuPont says it is? How about when grand-poo-bah Elijah says it is? How about when the US EPA says it is? Conversely, is r1234yf actually safe (let alone practical) when the SAE says it is? (i) Why do the majority of states in the USA still not have statewide bans on the use of HC’s in MAC? (ii) On the basis of what incident record did those minority of states that erected bans on HC in MAC base their legislation? (iv) Why did the U.S. NOHTSA back in the late 90’s say there was ‘no trend of HC MAC incidents’, and why have they never changed their position? (a) The natural consequence of a decision (including legislation) being taken without reliance on historical fact is, ipso facto, opinion. In the case of legislation, it is legislated opinion. I’ll leave your readers to make up their own mind as to whether or not opinion, regardless of how many legal notches it has on it’s belt, can alter fact. (b) If you want to get into a counting match about the number of legislatures that have blanket-bans HC’s in MAC vs the ones that don’t, HC’s will come out on top. But I don’t advocate going down this path because (as I’ve tried to point out) the information value contained in this-or-that legislature’s opinion-based legislation is scant. It’s really a waste of time and energy. If, however, there was a legislature that had discovered some kind of statistically meaningful trend of incidents in HC MAC, then that WOULD INDEED be valuable and worth bringing to light. But it doesn’t exist, as I’m fairly certain you are aware – otherwise you wouldn’t be relying so heavily on “news” about opinion-based legislation being enacted and instead be throwing up some deadly trend statistics in my face. I haven’t even touched upon the 50+ year oligopoly of the f-gas industry and how that affects industry groups such as the SAE and your very own MACs via cross-pollination and highly defined flows of information and trust. That’s a whole other issue to consider. …And anyone with a pulse realises that big business influencing of legislatures is the second oldest profession in history (behind prostitution). Now, this thread has just become a whole lot more unwieldy. Would you at least entertain me creating a Google Doc so we can tackle the issues with much more ease?